As an artist Benny Martin was difficult to categorize. He was known as a virtuoso instrumentalist that happened to be a powerful songwriter that happened to have an entertainer's mind for performance. In Bluegrass Music circles he was known as perhaps the greatest fiddler ever, and he performed and recorded with nearly every pioneer group in the genre, including Flatt & Scruggs, Bill Monroe, Don Reno, The Stanley Brothers and Jimmy Martin. His style was copied constantly, and his instrumental breaks on many of the Flatt & Scruggs classics are still considered the fiddle performances that set the standard still in place for Bluegrass fiddle playing. But Benny's career was much broader and more significant than this. None could match "The Big Tiger" as an entertainer. He became known as the "Big Tiger", and as a solo member and star of The Grand Ole Opry he became one of its most popular performers. He performed regularly on The Opry and played package shows with the biggest names in Country Music. 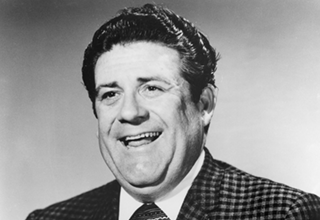 The Benny Martin Show became a Country Music hit, and his tours were popular in places like Chicago and Europe, far from the mid-south country music motherland of Nashville, Tennessee. He recorded hits like Ice Cold Love and Lover of the Town and performed them on The Opry and on television shows. Benny was always a rebellious kid, hitchhiking regularly at age ten to Knoxville, over 100 miles away, where he could see the "Mid-day Merry Go Round" and watch and study performers like Molly O'Day, Bill Carlisle, Charlie Monroe, and Jethro Burns. Benny began to play and sing, but his professional career didn't begin full-time until he was 13 years old. At that time Benny left home and went to Nashville to play with Big Jeff & Tootsie and the Radio Playboys in Nashville. Tootsie was the owner of "Tootsie's Bar" that was and still is behind the old Ryman Auditorium. Tootsie was known for her legendary care for musicians. She bacame a caretaker for Benny for the rest of his youth, and Big Jeff gave Benny steady work as they played radio shows in Nashville, Knoxville, and Chattanooga. Benny's first recording was for Big Jeff on the Dot recording in about 1944, and he made his first solo record in 1946 when he recorded Me and My Fiddle with Hillous Butrum for Pioneer Records. Benny began to appear on The Grand Ole Opry during these years, and his career was beginning to take shape. In 1947 Benny joined Bill Monroe's band and played with him during the time when Flatt & Scruggs left the band to be replaced by Don Reno, and Jackie Phelps. Later Benny too went to work with his childhood friend Lester Flatt and his partner Earl Scruggs, and was with them on and off from 1949-1953. In 1952 and 1953 Benny recorded 15 numbers with Flatt & Scruggs. These are perhaps the most important recordings ever made in bluegrass, and his breaks on Dear Old Dixie, Why Did You Wonder, and Flint Hill Special became, in essence, the style known as bluegrass fiddling. After sideman stins with Roy Acuff and Johnny and Jack with Kitty Wells, D. Kilpatrick of Mercury Records signed Benny to a solo recording contract in 1954. At that time Benny became a regular member of The Grand Ole Opry, began travelling with his own band, and hired Colonel Tom Parker to be his manager. Benny was hot material and drew large crowds and sold lots of records for Mercury. Despite his fiddling skills, Colonel Tom Parker, who managed Benny's career at the same time he managed Elvis Presley, would insist that Benny limit his fiddle playing so that he would be known for his singing. Benny noted that "fiddle playing was not respected in those days." Colonel Parker had also managed Eddy Arnold, Hank Snow, and The Louvin Brothers before he managed Benny and Elvis, but Elvis's famous 35 city tour of the East Coast essentially launched his phenomenal career. The recordings here are the best of the recordings Benny made for Mercury. Although Ice Cold Love was a big hit for Benny, Me and My Fiddle remained somewhat of a theme song for The Benny Martin Show. Despite Colonel Parker's insistence that other fiddlers like Howdy Forrester be hired for some of these recordings, Benny's virtuoso instrumental style can be heard on Me and My Fiddle, Ice Cold Love and The Orange Blossom Special. Lover of the Town featured Benny's guitar lead and also became a hit and one of his most requested songs. Like many of Benny's songs Lover of the Town is somewhat autobiographical, as is Read Between the Lines and Slim Chance. Really great music stands the test of time, and these recordings of Benny Martin represent the best of Country music in the 1950's. Although the lyrics of Girls might not be politically correct today ("I ought to get my gun, and shoot every one, so I can have peace at home"), the music has a raw power that has rarely been matched. These mostly original songs, with their creative arrangements and powerful singing, sounds as fresh today as they did on the Opry stage or on radio in the mid-1950's. Without a doubt it will sound fresh 40 years from now as well, because it is great music, craftily arranged, and performed by a genius of country music. Like Country Music in general, Benny and his career suffered from the rising popularity of Rock n' Roll. But Benny had another demon to fight in "the bottle". Unlike his friend Hank Williams, Benny lived to tell about it and eventually outsmart the addiction. The days of "wine and roses" as he calls it led to a volatile and uneven career. "I was on top of the world, but I didn't even know it. ", Benny says about his days in the spotlight on the Grand Ole Opry and star of Mercury Records. "It was something I took for granted." He was on and off the opry several times over the years, and his career continued to be affected by the addiction until on May 8, 1978 Benny finally gave up alchohol for good. Without a doubt his career would have skyrocketed again had Benny not become afflicted with a rare speech and vision disease called Blepharospasm and Spasmodic Dysphonia. This disease hindered his ability to travel or record much for many years, but like Earl Scruggs his performance scarcity seemed to enhance the legend of his playing. While players like Johnny Gimble and Vassar Clements stacked up countless recording credits, Benny rarely recorded or played. It seemed odd that one of the best that ever lived could temporarily lapse into obscurity, but his illness kept him out of the limelight. Surprisingly his fiddle playing never suffered from the lack of stage and recording time. Benny continued to write and play music almost every day during his illness, and his playing now is an eerie flashback to his sound of the 1950's. The legend of Benny Martin will live on. If you love real country music, but you like substance with your style, this is music you will cherish. There has never been another Benny Martin, and there never will be another. His genius for writing and performing is an American treasure, and he will go down in history as one of the greatest overall talents Country Music ever had. 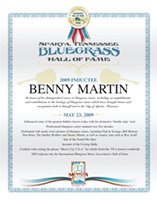 On October 27, 2005 Benny was inducted into the Hall of Fame of the International Bluegrass Music Association.